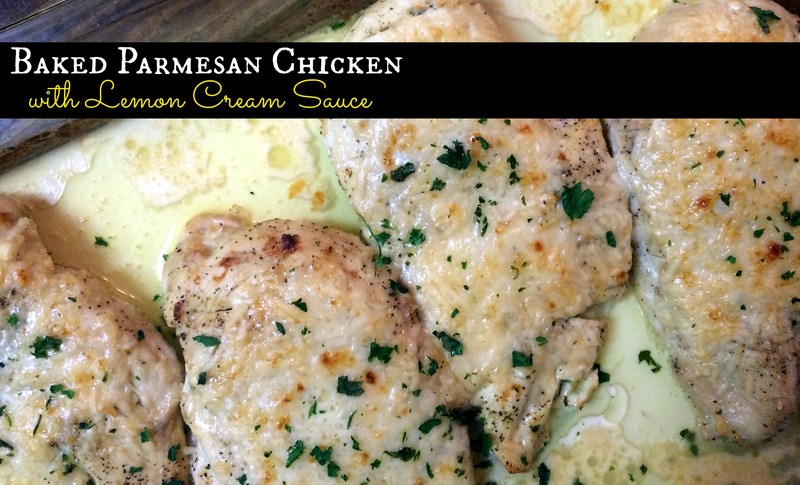 This Baked Parmesan Chicken with Lemon Cream Sauce was born last week completely out of me attempting to push my grocery trip back 1 more day. I just threw it together and hoped for the best. It turned out so good that I made it again this week. We served this chicken over spaghetti with marina the first time and the second time we had it over sauteed spinach. It is soooo unbelievably easy and tasty! Cut butter into pieces and place in bottom of 13 x 9 casserole dish. Add lemon juice to the pan. Sprinkle chicken on both sides with salt, pepper & garlic powder to taste. Place chicken in pan and bake for 20 minutes, Turn chicken over and spoon sauce over it. Bake for 15 more minutes or until chicken is cooked through. Remove chicken from oven to a separate dish. Add heavy cream to pan juices and stir. Add chicken back to pan and top with lots of shredded Parmesan cheese. 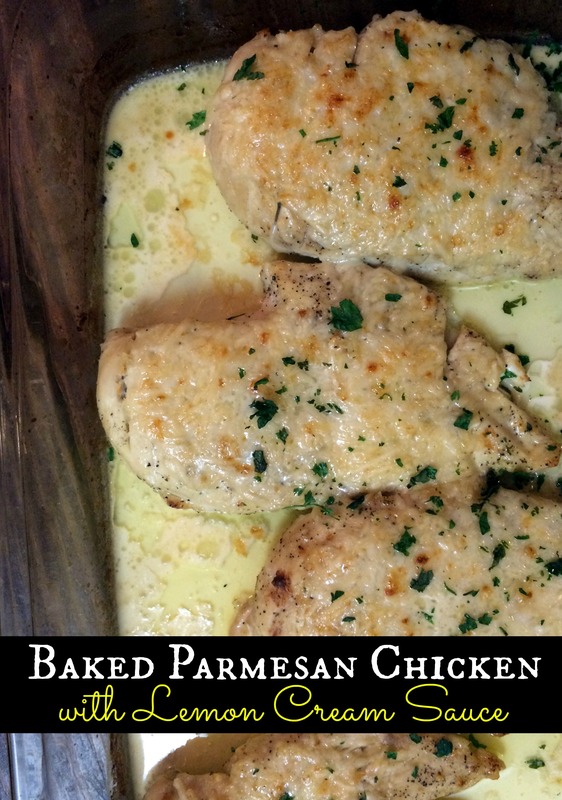 Spoon some sauce over the chicken and then place in oven under broiler until cheese is melted and starting to brown. Garnish with fresh parsley and enjoy! *Optional: If you desire a thicker sauce, whisk 1 Tbsp of flour in with the cream before you add it to the pan sauce. Thank you Brandi for the nice recipe. Sounds so good. Have a good weekend! This reminds me of Chicken Francaise which is served with rice. The real difference is that yours isn’t pounded and breaded. I want to try this. Also, when you used marinara, you kept this sauce as well, so the two more or less blended? Exactly. They blended really well! My son especially likes spaghetti with marinara. I just tossed the noodles with a little marinara and topped with the chicken and some sauce. Delicious! Hope you love it!